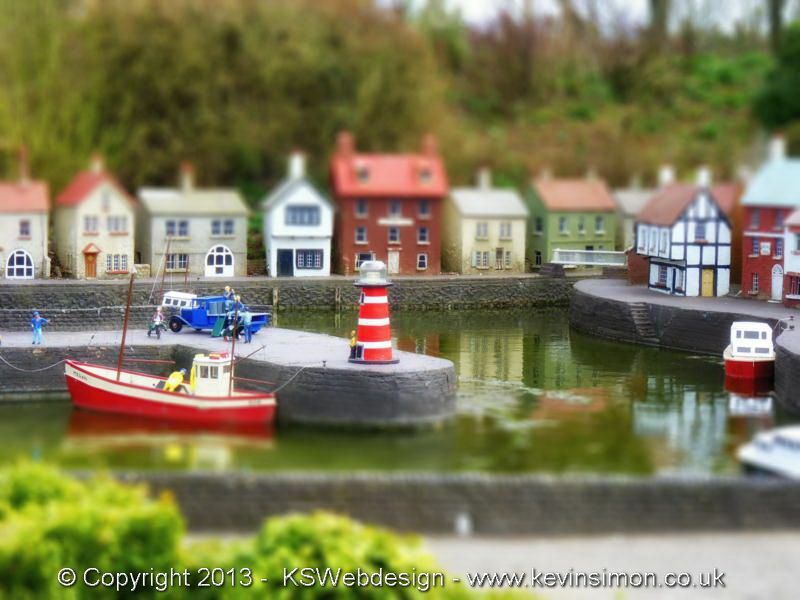 While on holiday earlier this year in North Yorkshire, we visited Bondville Miniature village in Sewerby, Bridlington. Now I love vising model villages, I always have since I was a kid, so when we got the leaflet for the model village at the tourist information we had to go. The Attraction is at the end of the road out of Bridlington, when you drive into the car park looks the place does look small but this is deceiving. Prices are £3.50 Adults, £2.25 Children, £2.75 OAP’s and a family ticket (2adults, 2Children) is £9.00, Parking is free. In the model village there are over 200 buildings and over 1000 figures all set in 1 acre of land, the models are highly detailed, in each scene there is so much to see from the people, Vehicles and houses. The Harbour is very nice, even with a artist painting a picture on the harbour wall, the street scene are nice also the large castle , if you visit make sure you look carefully at each part as something you can miss that are amusing. I would recommend walking around d twice and admiring all the mod to really appreciate the place. You could easily spend at least two hours looking around. All the models and the grounds are well kept we went in April but would be lovely in the summer with all the plants and shrubs in full bloom. Have a look at the quick video below of a walkround. The Model village has recently been taken over my new people, who are undergoing major revamp of the site, as the model village wasn’t in great condition before they took it over, I has the great pleasure of meeting the owned who explained about the problems and the time spent so far renovating the building etc, as you can see there efforts are paying off as it is really beautiful. There was a little quiz for the kids to do, so they had to answer questions about character etc around the village, this does keep the kids interested. Our kids enjoyed the few hours we spent their, though they are as interested that much as taken them around other model villages like Babbacombe model village , Lakeland Minature Village and Southport model railway.there is a small coffee shop that serves food and drinks. Here are some pictures from the visit, which is well worth a visit for all ages, as there is so much to see. It would be nice for us to go again once all the renovation the new owners are doing, as we could see their efforts were paying off when we went in about April so now I am writing this in august (took me a while to catch up with the articles on this site) would be great to see now. So if you are in the area or on Holiday that way I would recommend a visit as great value for money.